The iPhone app that is included with iDVR-PRO surveillance DVRs from CCTV Camera Pros has outstanding support for PTZ cameras. 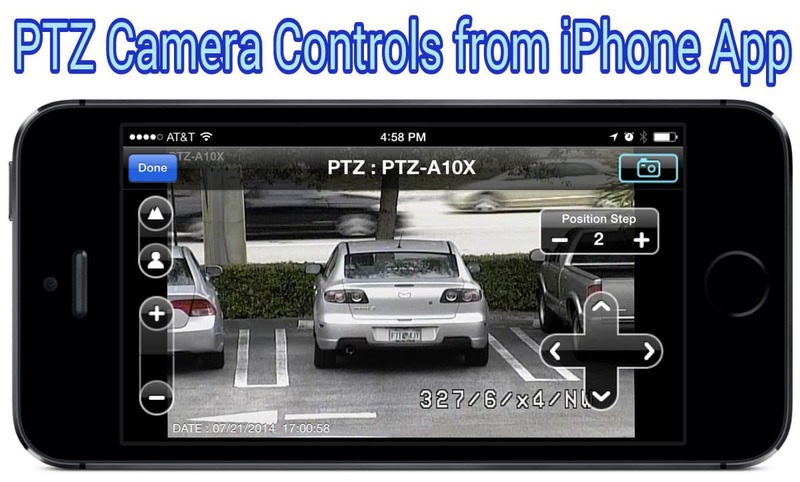 Users can control PTZ cameras from the iOS app, which works with iPhone, iPad, and iTouch devices from Apple. The Android app also supports controlling PTZ cameras. The pan tilt zoom controls work over WIFI and cellular networks (3G, 4G, LTE, etc. ), so users can access their camera and control movement on the local network where the camera and DVR is located or from remotely over the Internet. Any analog CCTV camera can be connected to any iDVR-PRO surveillance DVR. The video for the camera is hard wired to the DVR using coaxial cable (usually RG59 or RG6). 18/2 guage power wire or a single twisted pair from a CAT5 cable is used to run the RS-485 controls from the camera back to the DVR. This is what enables the DVR to control the pan tilt zoom of the camera. Because iDVR-PRO DVRs are network-able and can be accessed over the Internet, users can control any PTZ camera connected to the iDVR-PRO from any of the software clients that are included. iDVR-PRO includes apps for iPhone, iPad, Android, and Blackberry mobile devices. Remote camera viewing and control is also supported via Mac and Windows computers. The below images were captured using a PTZ-A10X pan tilt zoom camera that is mounted on the front of CCTV Camera Pros warehouse. The camera is connected to a 16 channel 960H iDVR-PRO DVR. We used the iPhone app to zoom in on a car that is parked in the marking lot in front of our building. The car is parked 70 feet away from where the camera is mounted and the camera is mounted 10 feet high. We captured images at 6 different zoom levels. When the camera is zoomed all the way in, the license plate of the vehicle can clearly be read. Would you like to login to our iDVR-PRO and control this PTZ camera using the iPhone app to test out the experience for yourself? You can also login from Android, iPad, Macintosh, and Windows computers. Please click here to request a demo login.